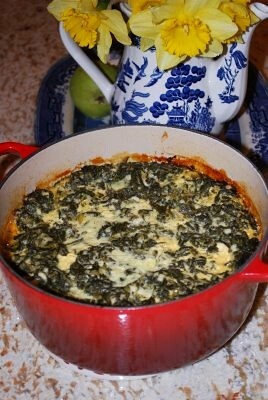 This spinach casserole has been one of my favorite dishes since childhood. The recipe came from the little booklet that came with my mom and dad’s Crockpot that they got back in the early 70s. 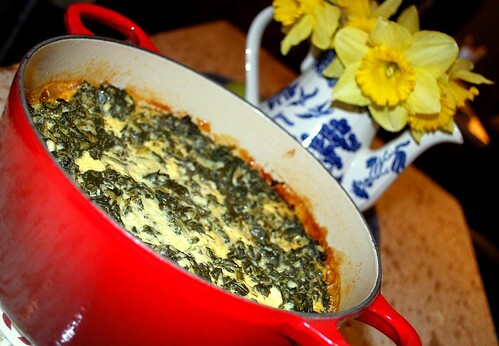 Over the years, we’ve upped the amount of spinach and also adapted it for a dutch oven, but it’s still a family classic. It’s a great way to get kids to eat their spinach; it’s a great way to get kids to love their spinach. 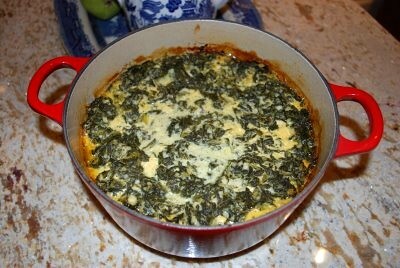 It makes a delicious veggie side to go with dinner or it makes a great dip served hot with crackers. No matter how you serve it, you are going to love it! Apply cooking spray to the inside of your crock pot. In a large bowl, combine all ingredients. Pour into prepared crock pot. Cook on high for 1 hour, then turn it down to low for 4-5 hours. You may also use a dutch oven for this dish. Simply bake, covered, at 375 for 1 hour.